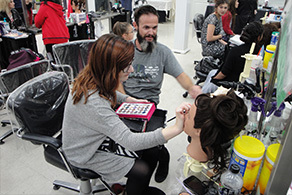 The Eastern Arizona Academy of Cosmetology program teaches students cosmetology principles and practice in a simulated salon environment. At the end of the program, our students will be prepared to take the Arizona State Board of Cosmetology exam. Good cosmetologists are in high demand, and they do much more than cut hair! Cosmetologists are business owners. They help clients care for their hair, skin, and nails. They work in beauty salons, day spas, cruise ships, luxury spas, and resorts. Many start their own businesses. A two-credit class covering the basics of manicuring, professional image and conduct, and hygiene. Four-credits of basic hair care and manipulation including safety precautions. Five-credits of instruction in basic haircutting and coloring techniques. A two-credit continuation of Cosmetology I, this class highlights the use of electricity and light in the cosmetology arena and includes ethics and salon management. Four-credit continuation of COS111, intermediate level instruction in permanent hair waving, chemical straightening, curling, shampooing, and hairstyling. Four-credits of additional instruction in haircutting and coloring techniques. Three-credits of advanced permanent hair waving, chemical straightening, curling, shampooing, and hairstyling. Two-credits of professional level of instruction in permanent hair waving, chemical straightening, curling, shampooing, and hairstyling. Four-credits of advanced instruction in haircutting and coloring techniques. Two-credits of professional instruction in haircutting and coloring techniques. One-credit basic instruction in the beautification of the hands, arms, feet, legs, and nails; the practice of massages, pedicures, and manicures. Four-credit instruction for students seeking a manicurist license; includes advanced instruction in the beautification of the hands, arms, feet, legs, and nails; the practice of massages, pedicures, and manicures. Four-credit instruction for students seeking a cosmetology or manicurist license; with additional instruction in topics taught in COS125. One-credit of continuation of COS121; with additional instruction in the beautification of the hands, arms, feet, legs, and nails; the practice of massages, pedicures, and manicures. Four-credit instruction for students seeking a cosmetology or manicurist license; with additional instruction in topics taught in COS127. Four-credit instruction for students seeking a cosmetology or manicurist license; with additional instruction in topics taught in COS150. Students must be a junior in high school and must have a minimum of ten (10) credits, two (2) of which must be English. Program runs from the end of July to the middle of June. Students attend eight hours a day until the first day of high school and four hours a day throughout the school year. Some Saturday classes are required. Students enrolled in the Cosmetology program through EAC may work towards their associates of applied science degree. This degree requires a total of 44 curriculum credits plus general education requirements and a GPA of 2.0 or higher. Students may earn a certificate of proficiency by successfully completing 44 curriculum credits and demonstrating mastery on both the EAC writing and math placement tests. Students will also sit for their certification through the Arizona State Board of Cosmetology.